Only a handful of jewelry pieces offer you that feeling of luxury and warmth solid gold earrings give. From casual creations to extravagant statement solid gold earrings, you can buy many fashion earrings. You can, practically, fill your jewelry box with unique earrings so it’s no wonder that you don’t know what to choose. But, rest assured, we have created this buying guide to help you out. Read further to discover the top 3 solid gold earrings styles that any woman should have in her jewelry box. 24k refers to 100% pure gold, but you cannot find that in a jewelry piece. Also, in other parts of the world, there is the 9k measure as well, but the minimum standard in the U.S. for a solid gold jewelry piece is 10k. In other words, when it comes to gold purity, there are 4 options for your solid gold earrings. As you can imagine, the more gold in the alloy, the more expensive the jewelry piece. There are many styles of solid gold earrings, but most of them fall into one of the main five categories. At the beginning of this article, we mentioned there were 3 types that any woman should have in her jewelry box, regardless of her personal style. Now you are going to discover more about them, according to your personality and preferences. Solid gold stud earrings are fashionable, lightweight and versatile. This is one of the styles that you should have in your jewelry box because they offer a lot of freedom. You can wear this type of solid gold earrings to a formal event and accessorize them with a statement necklace or gemstone cuff bracelet. You can also wear them to work along with a dainty chain necklace or when you go out for a party. Whether you have an elegant, sporty or boho chic style, solid gold studs are ideal. Of course, you can choose gemstone studs that feature a tiny precious or semi precious stone, simple studs or even thematic stud earrings. This type of solid good earrings also represents one of the styles you should feature in your jewelry box. Large, medium or mini solid gold hoops are great to wear to parties, as well as formal and informal gatherings. Daring women who love to make a statement choose large hoop earrings, while women who love minimal jewelry will adore solid gold mini hoops. 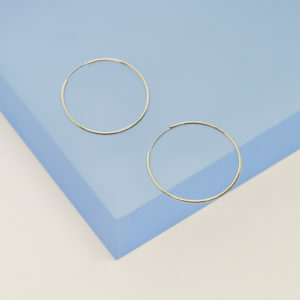 You can also buy twisted, geometric or freeform hoops, depending on your preferences. These solid gold earrings come in many different styles and we are sure you will find the perfect style for you. Elegant, creative and fashionable, this types of solid gold earrings is also one of the styles that shouldn’t miss from your jewelry box. Yes, we know that women who love minimal or story jewelry will say that drop earrings aren’t for them. But, in fact, drop earrings are so diversified that you will surely find a style that matches your preferences. Linear drop earrings, for example, are minimal and exquisite, while tassel earrings can bring a sporty vibe, depending on their design. Other styles of these solid gold earrings include the chandelier earrings, as well as pearl drop or dangle earrings. Ideal for rebels and women who love to sport a mischievous look, these solid gold earrings are great to stack or wear with other styles. As opposed to the previous types, cartilage earrings may not work for everybody, but you have to try them to find out. Clusters are elegant and bring a vintage vibe to a gorgeous silk dress. With multiple gemstones clustered together, these solid gold earrings are spectacular. Of course, just like cartilage earrings, they don’t work for anybody. Usually, women who love to dress elegantly adore clusters, but sporty and punk-rock women don’t like them as much. If you want to view our designer solid gold jewelry collection, visit Ana Luisa online jewelry shop. We are sure you will discover the perfect style of solid gold earrings for you.